Are you using Foursquare? If you are a shopper, you need to give it a try! Available on both Android and the iPhone, Foursquare is a GPS-based social media App that allows you to share your location with your friends on Facebook and Twitter. All locations and events will earn you points towards a weekly total, but some award badges as well. If you are the Foursquare user with the most check-ins at a specific location during a 60-day period, you will be proclaimed Mayor of that location. Once you can the hang of it and start accumulating badges, it gets very addictive. 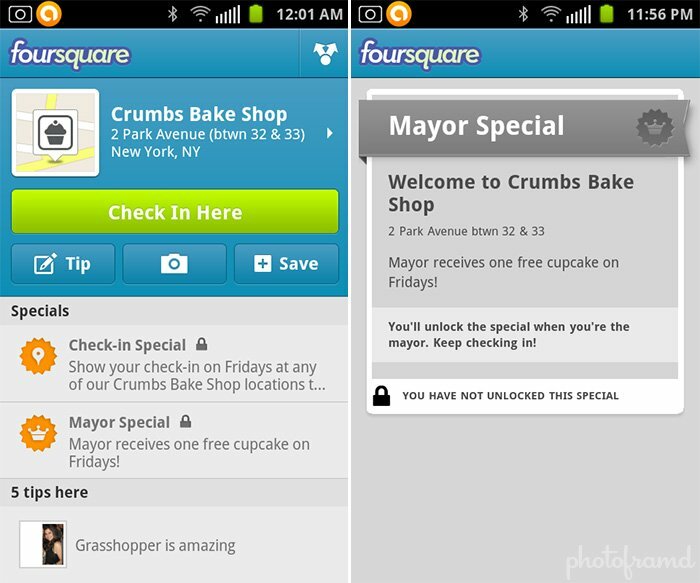 Foursquare has been working with local companies to provide its user-base exclusive specials and discounts. But, the even better ones are for mayors! Take a look at the one offered by Crumbs above. The Mayor gets a free cupcake on Fridays! Now that’s a reward. I am still trying to get this one. You can find these specials when you Check In. Just look for the orange Special flag on a particular location once your phone’s GPS locks. Thanks to a recent update, you can also click Explore and then Specials to find all offers in your location. For example, many McDonald’s offer free small fries just for a check in. Some places offer exclusive specials for the Mayor like this one from Perry Ellis — The Mayor gets a 30% discount on their purchase. A Mayor Special is unlocked when you are a Mayor AND check in at that location. These Mayor Specials started appearing during the holiday season and they are getting better. As a Foursquare user, a special could be enough incentive to sway a purchase. But, a Mayor Special is a great way to reward your best patrons.